This page discusses calf muscle anatomy and shows pictures of the calf/ posterior (back of) lower leg. The calf is located on the back of the lower leg. The muscles in the back of the lower leg are actually divided in two layers, superficial and deep. The superficial layer is what most people are familiar with because these are the muscles you can see. The superficial layer includes the gastrocnemius (gastroc), soleus, and plantaris. The superficial muscles appear on the left of the page. The deep layer includes the popliteus, flexor hallicus longus, flexor digitorum longus, and tibialis posterior. The deep muscles appear on the right of the page. If you cut away the gastrocnemius and the soleus, you can see the deep muscles of the calf. Okay let's break down the calf anatomy and talk about the individual muscles. The main action of the calf muscles is to point the toes or help to raise you onto your tip toes-- this motion is known as plantarflexion. 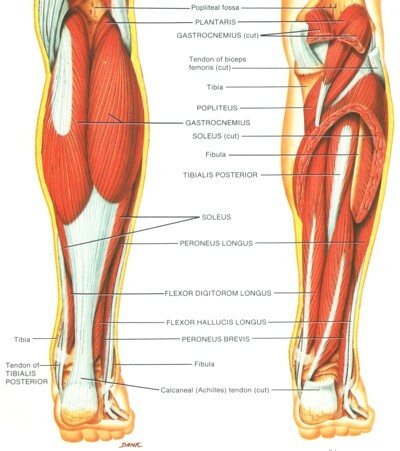 Every muscle in the back of the calf (with the exception of the popliteus) helps to raise you up on your tip toes. The gastrocnemius is the most superficial muscle of the calf, and it's the one you can touch simply by placing your hand on the back of your calf. It provides a lot of the power for jumping, sprinting, and walking. It also helps to bend the knee, but it's main action is on the ankle. The soleus is located just underneath the gastrocnemius, and together these two muscles form the Achilles tendon. Since these are the 2 biggest muscles in the calf, they provide the majority of the push off when walking, running, and jumping. The plantaris is a tiny muscle that simply assists the bigger muscles. The other muscles in the deep calf have additional actions on the foot and toes, but they also assist with pointing the toes (plantarflexion). The tibialis Posterior muscle goes from the back of the tibia down to the inside of the arch. It helps to plantarflex the ankle and pull the foot inward. This muscle helps to support the arch. The flexor hallicus longus is a muscle that goes from the back of the leg down to the bottom of the big toe (hallicus refers to big toe). This muscle helps with bending the big toe and also helps with pushing off during walking and running. The flexor digitorm longus is similar to the flexor hallicus longus, except it goes to the other 4 toes and helps to bend the toes. The polpliteus muscle is only located at the back of the knee, so it doesn't move the ankle or the toes. It helps to control the knee, when you're walking. This is just a brief overview of the calf muscle anatomy. These muscles all work when you do calf exercises, and of course they all work when you walk, run, and jump.